This is a weekly feature in which I (and maybe you, too, readers) detail the various reasons for hating your ballpark. 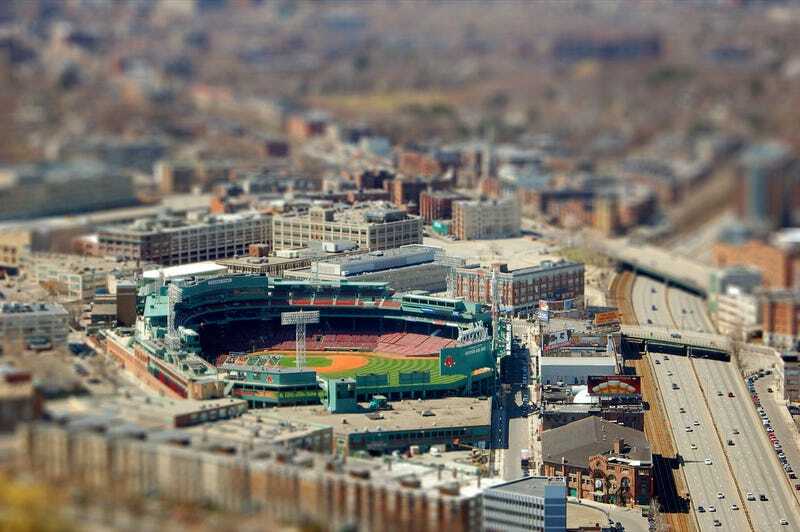 This week: The Boston Red Sox's Fenway Park. Nothing — with the possible exception of flowers, springtime and the 3rd Earl of Pembroke — has inspired as much gooey bad poetry and aphoristic nonsense as Fenway Park. If Fenway didn't exist, we'd have to toss a bunch of Harvard professors in a room to invent it, which, not incidentally, is how we also wound up with a war in Vietnam. "Fenway Park, in Boston," John Updike famously wrote, "is a lyric little bandbox of a ballpark. Everything is painted green and seems in curiously sharp focus, like the inside of an old-fashioned peeping-type Easter egg." This is just a new, sporty strain of that old New England exceptionalism that John Winthrop was preaching back in the 17th century. The thinking runs thusly: Fenway, like its tenants, is somehow different, purer, a perpetual innocent in a fallen, godforsaken world. "The Yankees belong to George Steinbrenner," Sports Illustrated's Steve Wulf wrote in 1981, "and the Dodgers belong to Manifest Destiny, but the Red Sox, more than any other team, belong to the fans." Let's just say it here, then: Fenway is not different. It does not belong to its fans any more than Tropicana Field belongs to its fans. "It was a land deal, nothing more," Dan Shaughnessy and Stan Grossfeld write in a book that otherwise treats Fenway like the biggest, greenest Kennedy brother. The name itself was free marketing for its owners, the Taylors' Fenway Realty Company, prefiguring all the corporate naming-rights deals that would come at the back end of the century. The front of Fenway, done up in a red brick Colonial style, was ripped off from Philadelphia's Shibe Park. The first outfield fences at Fenway were erected not to enclose the field of play but to block fans — the fans to whom the Red Sox allegedly belonged — from crashing the gate or sneaking free looks from the street, according to Shaughnessy and Grossfeld. Fenway isn't different. Fenway is merely old and has long enjoyed the happy luck of being located among the most literary-minded regional chauvinists in the Union, all of them drunk on a baseball stadium's smells, all of them turning over and over again into children. Me and a friend of mine were at a Red Sox game in Boston in the spring (I think) of 2005, about 10 rows back in the center field bleachers. Two drunk Tawmmys from Quinzee were sitting directly behind us, and spend the entire game yelling at Johnny Damon for having a little girl arm (while true, he's on your team, no?). One says to the other "I BET I COULD THROW A BALL FACKIN FAHHTHER THAN JANNY DAMON." Tawmmy Numbah 2 isn't convinced, neither am I, nor is my friend. Tawmmy 1 then bets my friend ten whole dollars that he can reach the infield on a throw. My friend laughs and takes the bet, as there's no way in hell this moron is actually going to try this during a game, right? Going back to Fenway after growing up with the park is sort of like meeting my dead grandfather if Wal-Mart exhumed his corpse and turned it into a cyborg greeter. It's amazing how what was once the best park in the majors is now an absolute cesspool of forced promos and moronic "fans." Went to a game last June and got to see some CEO throw out the ceremonial first pitch (at least I wasn't there for the NASCAR force feeding the following night) then another highest bidder threw out the ceremonial...um, second pitch. Followed by those two words nobody wants to hear and the abysmal song that follows. Saw a decent pitchers duel between Beckett and Haren, ruined by the pink hat buzzing in my ear about putting her house on the market from the time she showed up in the middle of the 2nd to the time she left with her posse of suburban moms who think they're the Carrie of their group in the middle of the 7th. The summer before my first year at college my Dad scored tickets for the Red Sox / Yankees at Fenway, something we had always wanted to go to. Believe me when I say that the real action wasn't on the field, but was spread throughout the bleachers. This was the summer of 2002, so we, as Red Sox fans, had yet to break the curse and become the most obnoxious fanbase in all of sports. Fenway was still a place of unabashed debauchery, racist Southies, and DRUNK B.U. students; Not a pink hat to be seen. A quick overview of the stands during the game revealed numerous amounts of fights and no small amount of hot dogs, beers, and plastic ice cream helmets flying back and forth between Red Sox and Yankee fans. Behind my Dad and I sat the biggest stereotypical South Boston resident I had ever encountered; He spent the whole game yelling at the middle aged women in front of us who had unwisely decided to wear their Bernie Williams' jerseys to the game. "Ber-knee! Beeeer-knee! Why are't you in da ghame Berrrr-knee?" Photo via B Tal's Flickr account. Next up: The New York Mets' Citi Field. Got any horrible experiences to share? Send them to craggs@deadspin.com.